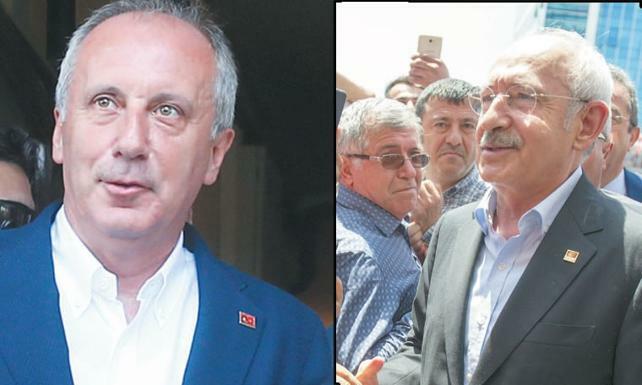 After Turkey’s main opposition Republican People’s Party (CHP) presidential candidate Muharrem İnce far outshined his party’s showing at Sunday’s presidential and parliamentary elections, there were calls for party leader Kemal Kılıçdaroğlu to resign, opposition newspaper Cumhuriyet said. Indeed, party members started a 24-hour protest outside party offices in Istanbul, Ankara and Izmir in the hope of provoking a leadership contest. Kılıçdaroğlu, who as party leader since 2010 has lost four parliamentary elections, two presidential elections and two referendums, responded by sending counter-protestors from among the party faithful and by reaching out to İnce, the newspaper said. “Everyone should know that Muharrem İnce is valuable to us, and we embrace him to the end,” it quoted Kılıçdaroğlu as telling around 250 supporters, joking that the rumours of tensions inside the party had finally got it into the headlines of the pro-government newspapers after months of pre-election silence. Kılıçdaroğlu also called for a special party meeting to address the topic of discipline. Parliamentarians and others who have called publicly for his resignation will be judged on whether they backed the protests or whether they limited their demands to verbal outbursts. İnce, meanwhile, was asked whether he would call for a leadership contest. “You won’t hear that from me,” he said, adding that no one should resign from the party following the elections. On being asked when he would next meet with Kılıçdaroğlu, he was also coy. “We see each other all the time,” he said. Kılıçdaroğlu ‘İnce’ye yardım edin’, İnce ‘Kurultay yok’ dedi. Partide tansiyon düştü.